Oh Wasn’t That a Party! 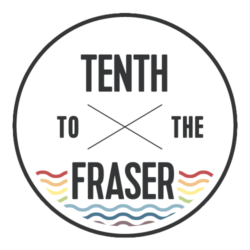 The New Westminster Museum and Archives collects objects and the stories that come with them. As you can see here, not everything in a museum is antique. Modern objects fill in pieces of the puzzle of our city’s history. One day, today’s everyday objects will become part of our generation’s history. Our job at the Museum is to ask questions and record answers. Who owned this? How did they use it? What did it mean to them? Are there photos of the owner with the object? 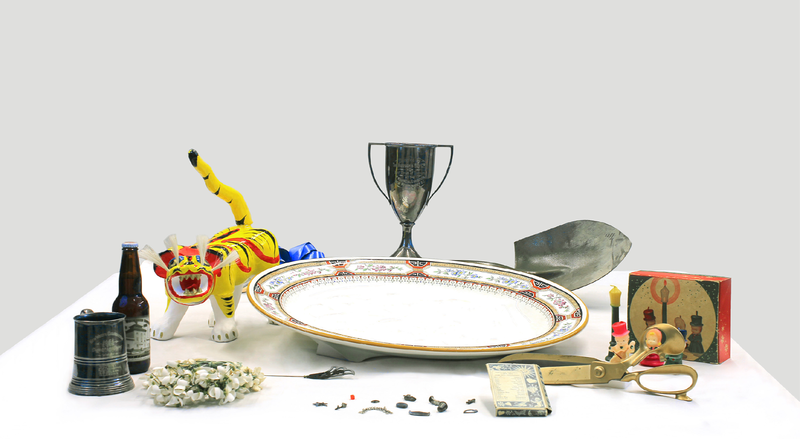 Every object in the Museum tells us something about the city and the celebrations we’ve had. 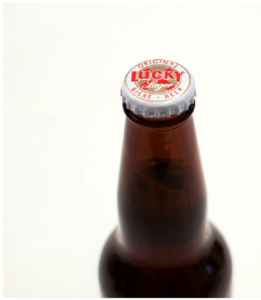 This commemorative Lucky Lager bottle was given to staff when Labatt closed its Sapperton brewery in 2005. The bottle still contains beer. In the 1930s, fortune-telling cake charms were baked into cakes. A die meant one was a gambler, a boat foretold a wedding trip, a baby predicted a large family, and so on. This shovel was used at a 1989 sod-turning ceremony for “The Renaissance.” The Italian-inspired condos built by the Molnar Group went up the next year along New Westminster’s waterfront. Alvina Eliza Clara Munn wore this crown as the 1899 May Queen. 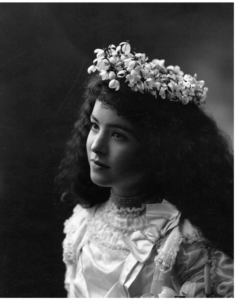 In later years, she performed as a soprano with the New Westminster Symphony Orchestra. A commemorative beer stein awarded to the winners of a local canoe race in 1893; H.T. Tovey (a Bank of Montreal clerk), E.H. Johnston, E.R. Wilson, and G.L. Brown (a clerk at a painting and wallpaper store). A 1867 turkey platter from the Briggs family, who were related to the original family at Irving House. Gravy dripped down the platter’s tree pattern into the depression at the bottom. A hatpin made of cellulose nitrate, a highly-flammable early plastic. 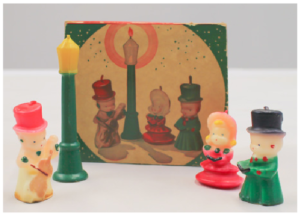 These unlit Gurley Novelty Company candles were probably used as festive decorations. This papier-mâché hariko is a gift from Moriguchi—New Westminster’s sister city in Japan. The bobbing-head tiger was made by one of the premier craftsmen in the Osaka Prefecture. Vancouver Mayor Fred Hume used these gold-painted scissors to open the third, and current, Granville Street Bridge in 1954. Hume was mayor of New Westminster from 1934 to 1942. 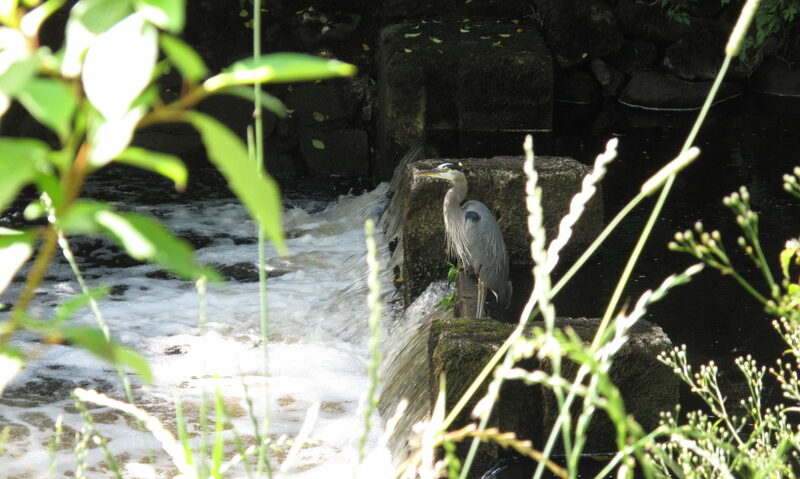 Hume Park is named after him. A trophy from the first Provincial Exhibition after World War I. 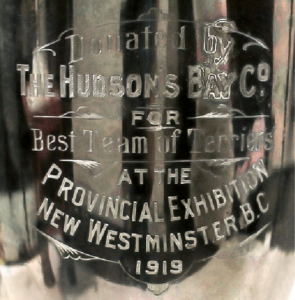 The Hudson’s Bay Company donated this trophy in 1919 to the Best Team of Terriers.